Helpful readers Jevon and RobL pointed me to Linda’s Coffee Shop in search of a decent cappuccino after my experiments earlier in the week turned up only pompous swill. Thank goodness they did. At 7:00 a.m. this morning I walked down into the heart of Ye Olde Charlottetown and into Linda’s, the only business open south of Grafton Street that early in the morning. I was the only customer in the place, and I parked myself right at the counter in front of the impressive coffee machine. I ordered a cappuccino, an English muffin and a side of home fries. No precious glass decanter. No annoying wooden stir-stick. No attempt to create a multi-hued, multi-layered experience. 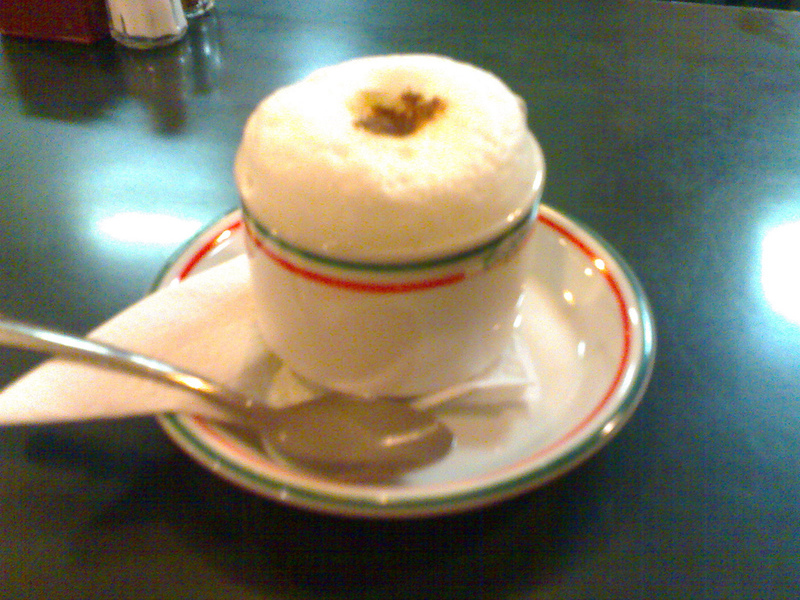 Just coffee and foam served in a proper coffee cup with a tea spoon on the side. I was beginning to lose hope. Obviously, by looking to the elite super-mochacinno-latte-bené palaces, I was staring in the wrong direction: if you want workaday cappuccino, go to a workaday coffee shop. I was so happy to have found a place that approximates what I had in Italy that I walked over after my meal to thank the man who’d made it for me, and we had a nice chat. Linda’s cappuccino is still priced a little high for my tastes at $2.50, but after what I’ve been through this week I’m not going to complain. And they make a pretty good English muffin too. Written December 15, 2006 at 8:07 a.m. I visit to Lindas for one of their love-filled breakfasts is at the top of my todo list when I get back to our wonderful city next week. Other that budget raw oysters from Carr’s at the wharf, one culinary delight I miss is the love-filled breakfasts at Maid Marian’s. I have trust that the cappuccino would not hit the mark but they have a superior sense of the role of coconut cream pie after a stack of pancakes at 10:30 am on a Saturday.